M.C.E. 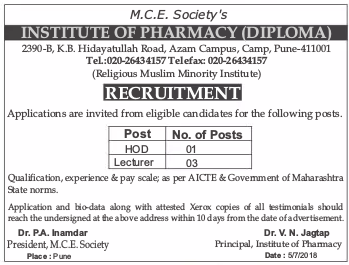 Society's Institute of Pharmacy (Diploma), Pune has advertised in Loksatta newspaper for the recruitment of HOD plus Lecturer jobs vacancies. Interested and eligible job aspirants are requested to apply within 10 days. Check out further more details below. About College: Maharashtra Cosmopolitan Education Society (MCES), was established in the year 1948 by Late Mr.Abdul Kadir Khan and others, with an objective of providing education to the economically, educationally and socially weaker sections of the society. It is an educational society registered under the Society’s Registration Act of 1860 and also a Public Trust registered under the Bombay Public Trust Act 1950. It is also registered under section 12(a)of Income Tax Act 1961 and is exempted u/s 80G of the said Act by the Income Tax Commissioner, Pune.